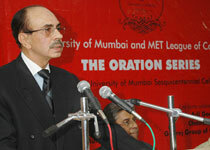 Sesquicentennial Commemorative Orations Program (SCOP) was partnered by MET for the University of Mumbai's 150 years celebration in 2006 - 07. Eminent national and international personalities were invited to address the students and faculty of University of Mumbai on a broad range of societal issues. The programme was launched with an address by Ms. Hanifa Mezoui - Chief, NGO Section, DESA who appealed to the students and academia to participate in attainment of MDGs. 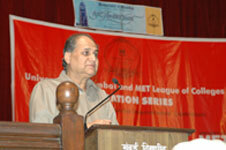 Subsequently, eminent economists, entrepreneurs & industrialists also shared their thoughts with students. 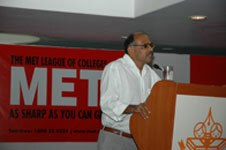 SCOP offered a unique platform for the propogation of Vidya Setu/Vidya Shakti for academia / society / industry interaction. An appeal was made to the corporates to promote industry-academia partnerships for supporting the MDGs. This was further broadened with support of NGOs who partnered with corporates for MDG support. Since MDGs would lead to development of an inclusive civil society, the college youth must be harnessed for participation internally and externally. Such unique programmes offer a rare opportunity which was utilized by MET.